If you truly like skateboarding, you are going to need a trick scooter ramp one way or another. Skateboard ramps and scooter ramps come in different shapes and sizes and can help you become a pro stunt skater. Choosing a good skate ramp is important as all your tricks will be based around this skate ramp. These skate ramps are not limited to pro skaters only as beginners can also use them in their tricks. However, some skate ramps especially the bigger ones are designed for professional use. Whatever your level or budget, we’ve got a fantastic option for you! OC Ramps are known for their high quality and this sturdy, high class plywood and lumber exterior half pipe is one of their most rated. It comes with an easy installation kit with very detailed instructions with pictures about the installation procedure. Why We Liked It – Besides the high quality wood, the metallic parts of the skate ramp are galvanized to offer protection from rust. Decently wide in size, this skate ramp is good for both beginners as well as pro stunt skaters. With this product, you get the ultimate skating experience like that in a skating park, anywhere you like. This Mojo quarter pipe boasts strength, durability and high portability. It consists of high tensile steel frames and a strong yet smooth polycarbonate surface over it. It also comes with a removable and adjustable safety railing. Why We Liked It – Both the frames and the surface are weather resistant as the strong steel frame is coated with powder so the pipe is going to last long. And the top rated part about this particular product is that there is a wheel kit so moving it around is super easy. Although it weighs 300 pounds, the wheels will make carrying it a breeze. Another great stake ramp from OC Ramps, this 4 feet wide quarter pipe has 3 feet height making it a great choice for stunt skaters. The high quality plywood used in the surface ensures smooth run and high jumps. Why We Liked It – The assembly kit comes with the product and installation is not that difficult, however, you might want to use some help putting in place the surface. The wheels under it make it super easy to carry it to the road or park and back to your house. Two of these can be combined to make a half pipe skate ramp. This ramp‘s surface is built from custom ramplate and the sidewalls are black laminated HDO plywood. Owing to these strong components, this ramp is designed to last long and withstand heavy skateboarding. The Ramptech Quarterpipe is easy to assemble and the assembly should not take more than an hour. And the convenience does not stop there: it weighs only 94 pounds, little less than wooden skate ramps that easily go over 100 pounds. The light weight makes it easier to move and store it. It makes a good choice for doing tricks in driveway or your backyard where you might be pressed for space. If you are too particular about having a perfect slope then this 3 foot quarter pipe should be your choice. Its computerized cut pieces ensure that you get the perfectly angled slope for your tricks. The installation is pretty simple with already cut and drilled boards and galvanized screws. The high quality plywood used makes it ideal for outdoor use. Its strength makes up for the short width of only 3 feet. If you are looking for a small, lightweight and durable skateboard ramp for street or transition skateboarding, this would be it. 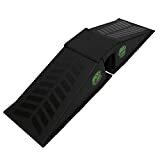 This Micro Flybox Launch ramp set offers two micro wedge ramp surfaces and a micro flat surface. The feet of this professional skateboard ramp are made of nonslip rubber as to insure stability and security during runs. This Ten-Eighty Micro Flybox Launch Ramp Set may seem like a ramp for beginners but it is good for any level of skateboarders. The wedge ramp has a small size and light weight which makes it mobile and can be combined with other skateboard ramps for larger variety. If you so happen to ride bikes or scooters this Ten-Eighty Micro Flybox Launch Ramp Set can be used for those rides too. This extremely lightweight launch ramp from Discount Ramps weighs only 10 pounds which means you can take it wherever you like. Despite the low weight, the surface is sturdy enough as it is made from strong molded plastic. Besides skateboarding, the same launch ramp can be used for BMS, scooters or even snowboards in winters. The maximum rider weight limit is 250 pounds which goes to show that it is quite strong indeed. The vertical end of the launch ramp is 13 inches in height giving you ample lift to perform tricks in the air. This combo with the rail is perfect for home use and is available to add to your cart with free delivery on Amazon Prime today. This BMX ramp by Discount Ramps offers both worlds by combining a launch ramp and skateboard grind box rail kit. The latter is 56 inches long providing ample length for the rider to land on the rail after going into the air. The launch surface of this BMX ramp is made of sturdy molded plastic with traction. Perfect for both indoors and outdoors, this combo ramp is lightweight and mobile. This is good for stunt skaters as it can withstand a lot of beating and stay smooth for a long period. The only box jump in the list is BMX full fly box jump ramp (pyramid style) made from molded plastic with traction. Able to stand 250 pounds capacity, this scooter ramp is smooth, strong and fun to run on. The product is easy to install with its interlocked snap-together design. The four launch ramps have decent length of 29 inches and you can use them for multiple kinds of rides including skateboards, BMX, bikes and scooters. Boasting Ramptech’s custom made ramplate surface, it is both strong and stylish. Using casters you can easily move it around. You can also take it apart and flip it. The galvanized steel coping is icing on the cake in terms of sturdiness. With 2 feet height, it gives you enough push to do your favorite scooter tricks in the air. The Ramptech Spine Ramp can make a perfect addition to your skateboard ramp or local skate park and give you variety to practice on. This is definitely a must have for pro stunt skaters looking to one up their skateboarding game. Often dubbed as the kicker, launch ramp is the most basic ramp that resembles an inclined plane. It is designed to give you a strong lift so as to perform flip tricks. They are often used for gap setups where two of them are placed at a distance. This kind of ramp is a combination of two launch ramps placed facing away from each other with a flat surface between them. This skate ramp is good for performing different kinds of tricks as you get both flat and sloped surfaces to play around. Quarter pipe ramps are curved and have a quarter of a circle’s circumference, hence the name. This is a pretty popular kind of skate ramp among skaters as it gives you ample air when launched from its peak to perform tricks. It gives the skater enough control to do air tricks even in the middle of a run. It is ideal for quick grabs and grinds. Half pipe ramp basically resembles half pipe and is good for back and forth action. Consider them as two quarter pipes where you can constantly do scooter tricks every time you launch, speed up and down as you go. Similar to quarter pipes, these have an additional surface towards the vertical end which basically allows you to land back in the same angle you launched from. This kind of ramp is made of two quarter pipes placed back to back. The skater can transition midair in a spine conserving the momentum during the run. The 4-sided pyramid skateboard ramp is essentially a double box jump or a half a pyramid. They have four ramps coming down from a central flat surface. The greatest thing about these is that you can go from any side and land on the other side. It is great for multiple skaters looking to perform tricks with one ramp. Resembling the crests and falls of a wave, these ramps have multiple curved surfaces connected together. They provide limited air to the skater after which they land on the next curved surface. What is a mini ramp? Ramps that do not have a high vertical surface are usually considered as mini skate ramps. For instance, a half pipe less than 7 feet in height would make a mini skate ramp. These ramps are at times homemade and used for doing basic jumping obstacles. Should you need to get a ramp for skating depends on the kind of ride you are going for: street or transition. The former uses skateboard rails, grind boxes and other flat offering whereas the latter is the playground for ramps like half pipe, quarter pipe etc. There is no set age or experience limit when going for a ramp to skate on. Beginners and pro skaters both use ramps in their runs and perform tricks. However, the size distinguishes beginner and stunt skaters as ramps that provide stronger and higher lifts are suitable for professional skaters only. The bigger the skate ramp the more room you have for practicing different tricks and transitions. Of course, that means a bigger price tag too. If you can afford to buy a bigger and wider ramp then by all means buy one. The wideness of the ramp does not have much to do with the style or experience of the skater but generally, the wider the ramp the better. Many professional skaters go for mini ramps for their backyards or even indoors. This is because they have experience and control over their run and they can easily maneuver mini ramps in confined spaces. Skateboard ramps prices vary greatly by size, type, style and brand. There are pricey ramps too that are priced over $1000 but you can easily find a decent quality skating ramp under that. It comes down to your own budget as to which ramp you can afford. Usually big sized ramps are expensive. For those with limited budget, mini skate ramps make a good choice as they are quite affordable. You can find a mini launch ramp for under $50. Building your own ramp can be costlier than buying one online. As opposed to fixed ramps, portable ramps are moveable and thus make your life much easier. They are cheaper and you can take them to different places and try different terrains. You can use them whenever and wherever you like without hassle. They are foldable too so they will not take much space when transporting. If you desire a wide range of ramps you can take your portable ramp to a skater park and practice various stunts. Like skateboards, it is important to take into consideration the skater’s weight. While most ramps will easily be able to stand weight up to 100 kilograms, some might not be so sturdy. Make sure to know the maximum weight limit the skate ramp can tolerate. The material used in the surface of the ramp determines the life of your ramp. Surface is the prime contact point for the skateboard wheels and it is going to take most of the beating when you run and perform tricks and transitions. There are plywood, Masonite and molded plastic surfaces that offer their own unique strength. The surface can get ruined with rain or direct sunlight so a good quality ramp would have weather resistant surface. Paint can also help protect the surface from rain. The ramp should be secure enough and should stay in place at all times. The screws and other fixtures that accompany the ramp should be of good quality and easily fixable. Additionally, sand bags can be used to keep the ramp in place when you jump off it. Remember scooter riders to always wear a suitable helmet to save your head. The price and quality differs from brand to brand. Some brands are popular then others and are known for their quality. However, in choosing the right skate ramp for you brand should not be a prime consideration. Besides dimensions, weight of the ramp should be taken into account too. If you are going to move your ramp a lot, buying a heavy ramp would only make your skating difficult. Also, the strength of the ramp does not really depend on the weight as even light weighted ramps are strong and durable. Some ramps come with a warranty as well which is great as you can test the product in that time-frame and should there be something wrong, you can get it replaced. The practice for choosing the most suitable skateboard ramp for yourself is to identify your style, needs, measure the space you have available for installing the ramp and your budget. Go for a product that checks most of your requirements while not crossing the budget you have set for this purchase. Also, it is good to inquire about a ramp from your fellow experienced skateboarders and of course read reviews present online. How much time does it take to install a ramp and what tools would I need? Installing a ramp is not a very complicated procedure as most skateboard ramps are made to be installed and fixed easily to any home environment. Most skateboard ramps come with detailed instructions, often with pictures, that lay down step by step instructions for each and everything, from unpacking the components to fixing the screws. The whole process can take from 30 minutes to an hour. The ramp boards are usually cut and drilled so all you need to do is fix in the screws into the holes with a screw driver. If they are not drilled already, you are going to need a drill for drilling holes. The instructions accompanied with the product would also lay down instructions about where to install the ramp. The procedure may differ from surface to surface, for example, if you are installing the ramp on concrete you might have to drill some more holes. With the help of the guide you should be able to fix the thing by yourself. The instructions are simple yet detailed enough for you to fix the thing by yourself without needing any professional help. However, using help will get the job done in much less time. How long do skateboard ramps last? Most ramps are designed to last for quite some years but it boils down to how you use it. They do require a bit of care at your end. Outdoor ramps need paint to protect them from rain or scorching sun. Wooden skate ramps are considered better by pro skaters as they are sturdier. However, plastic mini ramps are no less when it comes to durability. If you are investing into a big plywood skateboard ramp, you need not to worry about durability as they are designed to take heavy beating from your skateboard wheels. Pro skaters go for wooden skateboard ramps over plastic ramps as they are strong and durable. No matter how frequently you use them, they will last long. Of course, durability varies between different skateboard ramps depending on material’s used, construction, and brand. It also depends on how good you have fixed the ramp as a wobbly ramp may not only ruin your run but also deteriorate in quality over time. The first question that pops in mind when one is about to buy a skateboard ramp is whether it is safe, especially if you are a parent buying a skateboard for your kid. Yes, skateboard ramps are safe provided they are securely installed. As for the ramp itself, as discussed before they are made using tough materials so they do not break or snap. However, they can move from their position if not fixed properly. The greatest way to ensure optimum safety is to follow the instructions that come with the ramp. Many a times, these instructions have pictorial representations as well to make things further clearer. If you thoroughly follow the exact instructions, there is no way your skateboard ramp will shake or move from its position. For someone who has never installed a skateboard ramp before, it is recommended to do so under supervision of someone experienced. In the safety context, there is a misconception that ramps perhaps are reserved for only the pro stunt skaters. That is not entirely true as even kids under 10 use skateboard ramps for playing tricks or riding their kids scooters. However, the bigger sized ramps like vert ramps or half pipes are most suited for professional skateboarders only. The ramp can be made further secure by adding something to its support. You can place a sandbag at the vertical end of a launch ramp to further prevent it from sliding. The ramp can be fixed on sheets of plywood for providing extra support to its feet. The screws used should ideally be galvanized and rusted screws should be replaced. Skateboard ramps for stunt skateboarders come in different shapes, sizes, styles and brands with each offering something unique on its part. The key to choosing the right skateboard ramp is to identify your style, space and budget. If it is too big for your space you will not be able to run and use it to its full potential. Similarly, price plays a big factor too as good quality big skateboard ramps can easily cost over a thousand dollars. You can easily install the setup anywhere you like and most ramps now are quite portable. As a stunt skater, you can combine different ramps to practice new tricks whether at home or in your skate park. If you take good care of the ramp, it may last for years to come. Craig here. My son wanted us to build him a ramp really badly, however, I am not too great with woodworking. So we ended up going for the Rampage set to start with, now he has the Ramptech quarter. That one is highly recommended.